Wizards of the Coast delivers an all-in-one experience with the newly released Dungeons & Dragons Starter Set. For those who have ever been curious…for those who have ever wanted to try it out and just didn’t know where to start…for those who just want to try something new for game night…this is one box, containing everything you need to get on your way in the Dungeons & Dragons universe. While D&D can hardly be considered a board game, the Starter Set is packaged just like one, making for easy storage of all your D&D gear. Within the box, you’ll find everything you need for your game (which, for the uninitiated, looks rather sparse). Dungeons & Dragons has always been a game that relies more on imagination than game pieces, and the starter set reflects that. There are six game dice included – one each of d4, d6, d8, d10, d12, and d20. These are used to determine the course of your adventures, in many different ways. You’ll also find five character sheets, which can be used to craft the characters each of the players will use in the game. Each sheet gives pretty much everything you need to know about your character – whether you choose to be a wizard, a cleric, a fighter, etc., your character sheet lists your abilities, your proficiency, armor class, speed, and more, along with your background, information about your race, and what happens when you level up. These are intended as sort of a cheat sheet for newcomers, (and can be replaced by your own creations as you become more proficient in the game) but even with so much provided for you it’s still up to you to make your character your own. Each player must give their character a name, describe them physically, and let their personality develop as they play the adventures. Of course, all of that sounds rather confusing if you really don’t even know how to start, and so two books are also included in the set. The Starter Set Rulebook lays out how how to play the game. Because D&D has always been a game that is run by one player (the Dungeon Master), who guides the others along the adventure, it isn’t necessary for all the players to read through this. However, it does give you a really good idea of what to expect when you get into your game, covering everything from literally how to start and how combat works, to adventuring and spellcasting. It seems like a lot to take in, so it’s best to keep this book handy for your first few sessions, for easy reference. The other book included in the Starter Set is entitled Lost Mine of Phandelver, and it is a complete adventure, including everything your Dungeon Master will need to know to run a successful adventure. There are maps, descriptions and stats for the creatures you encounter, and a handy index that helps you quickly find answers to any questions that might arise. Most importantly, it contains the first adventure your team will go on, introducing you to The Forgotten Realms and how an adventure should play out in the best way possible – by doing it. The adventure itself is quite engaging, involving a lost mine, greedy goblins, and plenty of scrapes for your crew to get into. It’s also quite lengthy, and should give you many hours of play (and because the choices made affect how it plays out, you can even reuse the adventure multiple times if you like). The Dungeons & Dragons Starter Set is meant for complete beginners who would like to get started in the game, and so I wanted to gauge how well it translates to those who have never played it before. So I gathered a group of six – five were complete beginners, and one experienced player for reference purposes. 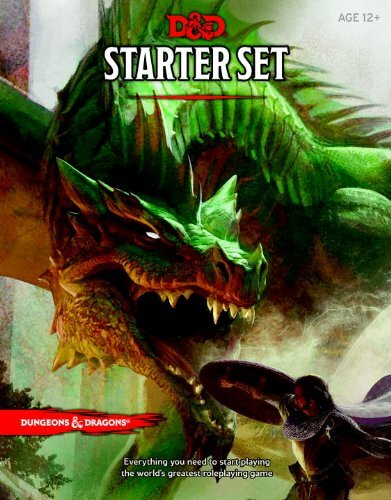 We found that the Starter Set really does offer pretty much everything you’ll need to figure the game out (although it really helps if your Dungeon Master puts in a decent amount of time learning the ropes before the game begins). There were a few times when questions arose, even with the books included, but they were fairly infrequent. For those cases, if you don’t have an experienced player to guide you, you can find rules online at DungeonsandDragons.com. The Dungeons & Dragons Starter Set offers the perfect solution for anyone who has every wanted to give the popular role playing game a try, but was intimidated by the learning curve. The set gives you a head start with fully fleshed character sheets and an engaging adventure, and of course your first set of dice to get you started. It’s a great place to begin, and designed with the beginner in mind, it serves well to immerse newcomers in the world of D&D painlessly and with maximum enjoyment.